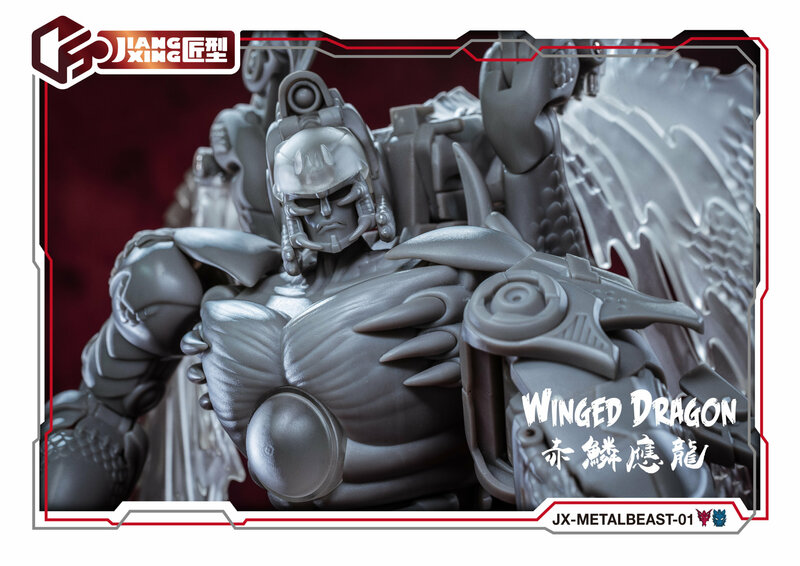 After our first teaser in January, 3P company Jiang Xing have revealed images of the gray prototype of their upcoming JX-Metalbeast-01 Winged Dragon (BW Transmetal 2 Megatron). 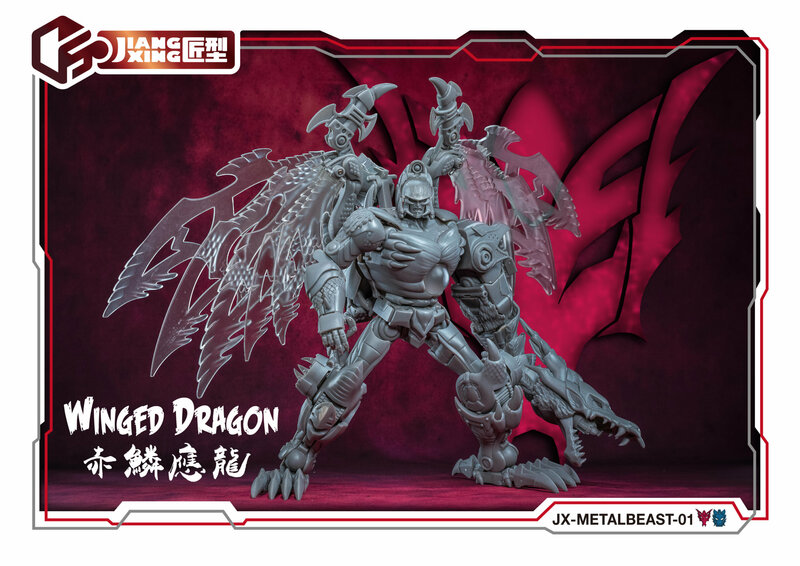 The images were shared via Jiang Xing Facebook and we have a very nice and detailed rendition of Beast Wars Transmetal 2 Megatron. 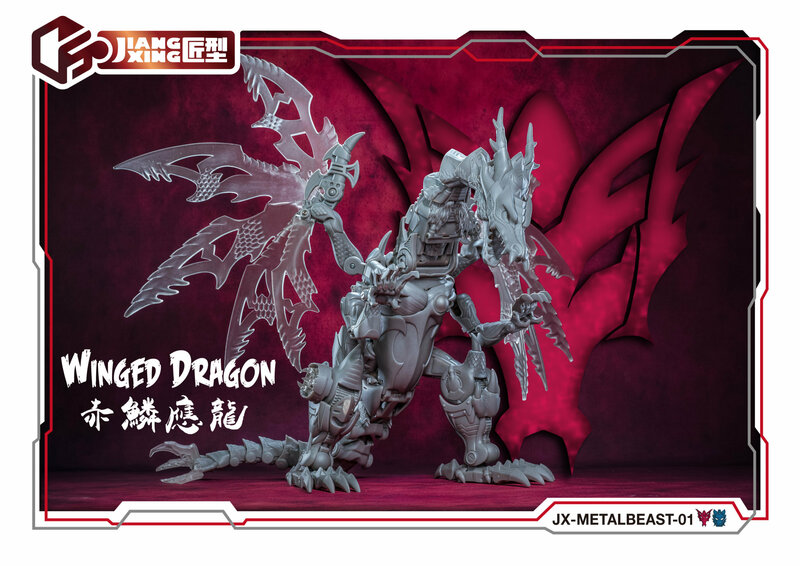 While being a bit stylized, we can say he’s cartoon accurate in both robot and dragon modes. The figure will include interchangeable faces and he can even transform into the third “transportation” mode. 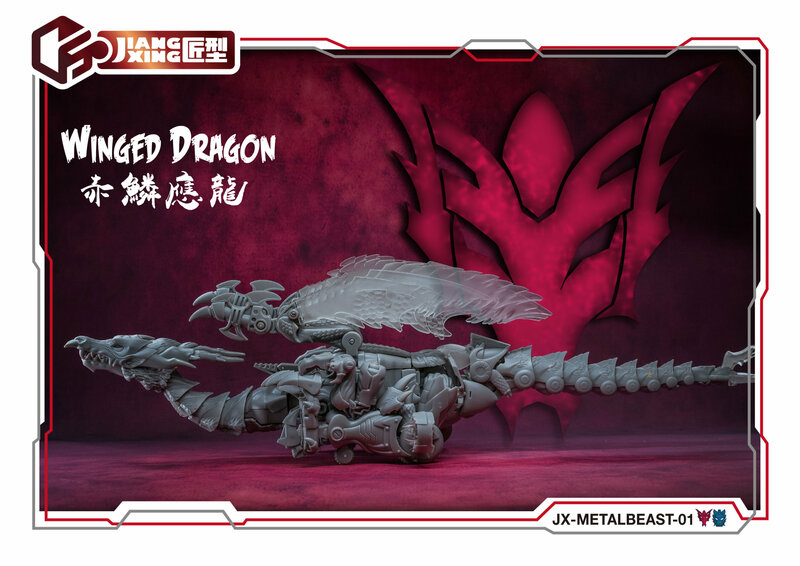 According to the information shared, this release is Masterpiece-scaled and more Beast Wars figures are coming in the future. Still no information or release date available, but you can now click on the bar to see the mirrored images attached to this news post. After that, you can sound off on the 2005 Boards! PE-DX09B Psychro Knight from Perfect Effect stands 25.4CM/10" tall in robot mode and is made of PC-ABS and die-cast parts. What sort of wonky knock off rulers are you looking at? 30cm is basically 12 inches. Well, MP-43 is already out for frame of reference and GALVATOM & company have already put forth extensive work into the scale chart. Rampage is supposed to be larger than TM Megatron, so Rampage better be larger than MP-43. I honestly don't mind that TM2 Megatron ends up a bit smaller than the scale chart suggests, since the scales of some of the larger characters got ridiculous in season 3 (and not in a good way). However, JX really has no excuse at this point to produce a Rampage that is smaller than TM Megatron, much less MP-43. If he ends up smaller than MP-43 as you suggest is possible, then I will be disappointed. Personally, I'm hoping Rampage ends up being 28 cm at the top of the head, give or take 1 cm. More on topic though, TM2 Megatron is looking fantastic so far. It's too bad JX is having trouble finding a suitable partner to meet their standards for a fully colored product. However, JX's standards being so high has me hopeful for the final outcome of the product. I drew this up a little while ago under the impression the very top of the helmet, missile launcher and all, would be 30cm off the ground. We now know that it's actually the visor that sits at 30cm. I foolishly cut the wing tips off making this image but without drawing up a new one it certainly looks like they'll be near 35cm if not more. Wingspan is going to be insane, eclipse the shelf type stuff. Haha no worries. I've heard it said JX has been part of other companies, I may be wrong. This release seems like the beginning of a new company so maybe it's just something they haven't sorted out yet because they wanted to have a near finished product produced before they had painters look at it. That's all guesses on my behalf though. I really hope this and Tyga Eagle are a success so they continue to do more, either TM or TM2, either way I'll be grateful. That wasn't directed at you. I'm just saying, that they should've had this all figured out beforehand. Working in contracting based business as well, contractors can always make false promises, nothings guaranteed. They may have had a company ready to go then when they saw the proto he said no way. Beats me man, I don't know anything about toy manufacturing, I was just commenting on that post by Cheem the Rump on the previous page that had a translated quote from JX. That all sounds right based on our findings making the chart. Nice to see the missile launcher on top of Megs head is a bit higher than 30cm too judging by that picture next to the ruler. I'm don't know who I want them to do more after Tyga Eagle; Rampage or TM2 Dinobot? Really impressed with the mould of TM2 Megs. 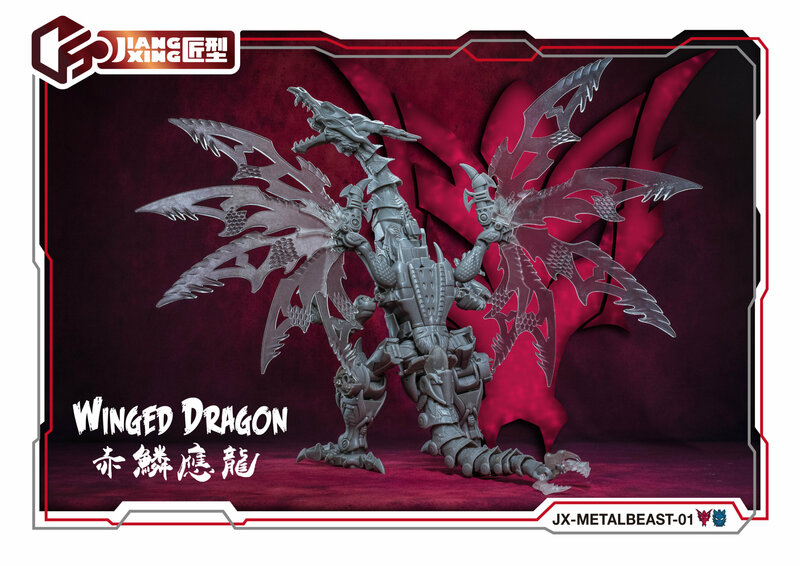 Truly a MP, has anyone digibashed it yet? 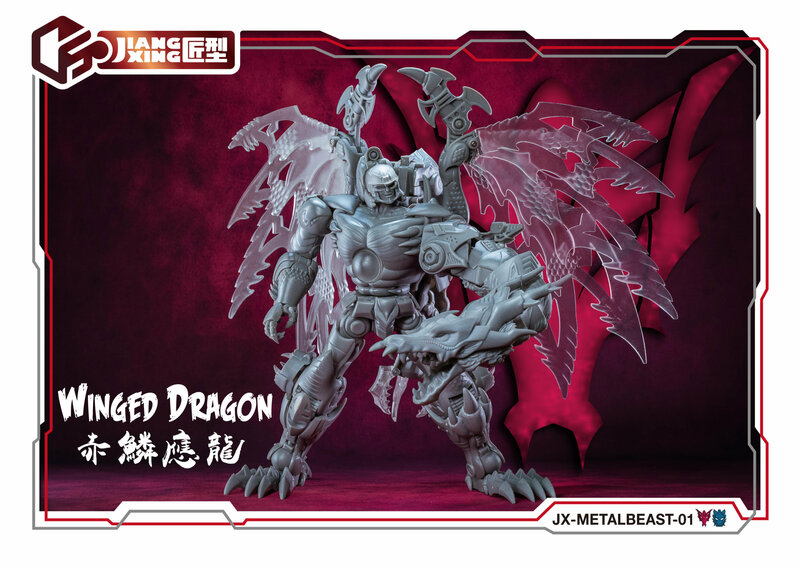 I’d want tm2 dinobot the most but knowing that they’re doing megs and tigerhawk is very pleasing to say the least. I have a good feeling about this company. Also yeah I believe the pics we got from the company themselves where renders of what the color will look like. Shouldn't that have been figured out before now? What type of ruler is that? That's a shame they're having trouble finding someone up to painting this to the standard they want. Well there is a specific scene from Other Victories where Rampage grabs TM2 Megs threatening him and they stand eye to eye. Which is why I made that comparison, this chart has him about a head taller, interesting. Either way though, yesssss he will be a big boi, and mine!